What is the first thing you hope visitors notice about your community? Maybe it’s a stately line of trees, a welcoming sign, or a quaint shopping district that invites newcomers. I have similar hopes for my community. However, for many years, the first glimpse of our neighborhood visitors saw as they turned into South Atlanta was a billboard warning against sexually transmitted diseases. My favorite iteration was a recent campaign that advertised a “syphilis tsunami,” repurposing the famous Japanese woodblock print of a giant wave with the offer of a free STD check. I understand and appreciate the real work of supporting public health. And I recognize that campaigns like “syphilis tsunami” meet a real and growing need across the country, including communities like mine. But I still can’t help but wonder about this impression of our community this sign offers to passers-by. Like so many well-intentioned programs, it highlights areas of weakness and challenge that are often associated with our neighborhood, rather than the creativity, strength, and innovation we know resides here. At Carver Neighborhood Market, we are also working towards a healthy community. So when we had the opportunity to purchase some advertising, I knew I wanted to take over that billboard and tell a different story of South Atlanta. 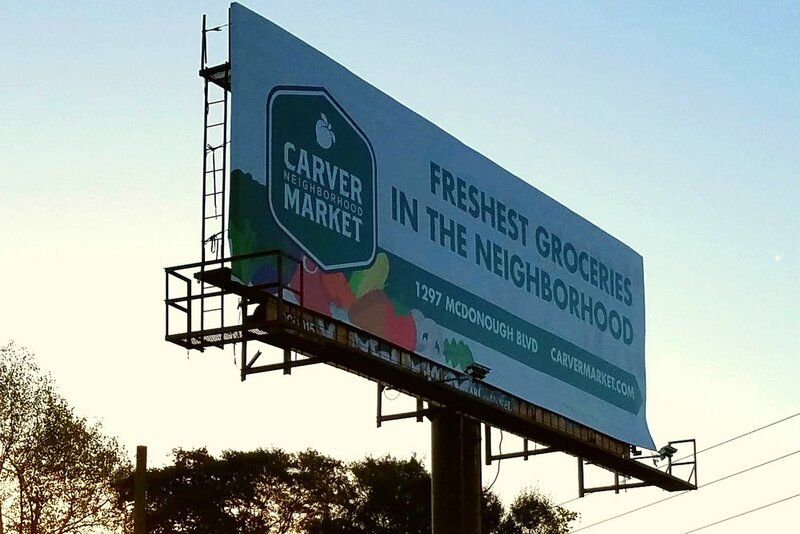 Today, new visitors first notice a billboard proclaiming, “Freshest groceries in the neighborhood” and pointing in the direction of Carver Neighborhood Market. We are proud of the robust and colorful produce we offer, along with the pantry staples and grocery products our customers love. And it’s a team effort. We hustle to source groceries from farmers and partners who may not be used to delivering to a smaller store off the beaten path. We are constantly listening to our customers and adjusting our inventory to match their needs. This is the story of the South Atlanta we know and love. I hope when visitors drive by the new billboard, they will see a different message about our community. We care about being healthy. We create solutions to long-standing problems. We work together to build a stronger neighborhood.